Bow Wow is a 3-reel 3-payline video slot themed around dogs. Below the reels there is a row of five casino chips, and you may pick one of them to determine a coin value for your bet. Each line accepts a single coin, so your total bet may range from $0.1 to $6 per spin. The symbols include five different dogs that award you various payouts if two or three identical dogs appear on an active payline. The white mongrel with a black spot around his eye awards the highest prize if three of them land on a payline. The winning amount for that combo depends on which payline the three mongrels landed; hitting these three on the first, second or third line awards 300, 600 or 900 coins respectively. Therefore, the maximum prize you can scoop in the game reaches $1800 on the max bet. 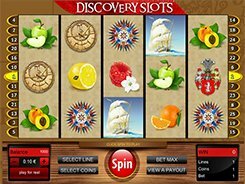 There are no special bonus features like scatters, wild symbols, free spins or bonus rounds that are found in abundance in modern 5-reel games. 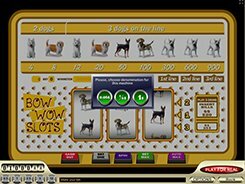 Being a very easy slot to play, Bow Wow offers a fast gaming action, nice graphics and low betting limits that would be appealing to beginners. PLAY FOR REAL MONEY!